I have been reading Sam’s posts for years and this post is very different, very refreshing, yet still ties back to personal finance, plus I think KonMari is a show that my wife and I can watch together, an added bonus. I look forward to reading more of your post in the future. I just purchased a LED light bulb that is WiFi connected to my phone. I installed this on my front porch, and it will save me fumbling in the dark to find my keys. That is a joy and the solution to frustration I have felt for years. Now I need to find such motivation to do the opposite. My wife is much worse, as I am fairly good at cleaning up and being neat. My wife and I are the opposite of the stereotypes. I also have a lot of things in my home that are old. I buy few things, but keep them forever, so they tend to accumulate. I think it’s time to get my wife and I to watch that show. I was surprised to see the KonMari method on Financial Samurai since it seems that females tend to be more interested with keeping things tidy. Glad to see that FS is always striving to be a well rounded website. I liked the twist on how the method could be applied to personal finance. 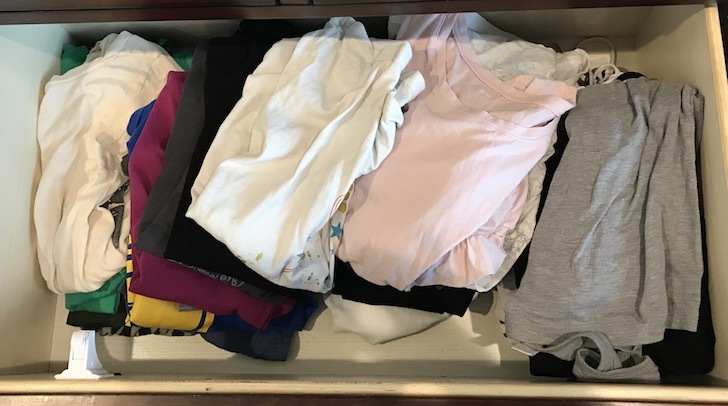 I tried the KonMari method last January since my book club was reading her book. It was fun sharing with other members about our progress and helped to keep us accountable. I found the biggest help was Marie’s tip for having a designated place for every single thing I owned since it saves time for searching for the needed item and keeps the house clutter free. I also loved her tip for only keeping things that spark joy which I’ve also used when purchasing things. It’s so nice to instantly smile when I pull something out of the closet or a favorite piece of art catches my eye. Sydney! What a great guest post! I recently became an empty nester (!) so I took that opportunity to declutter the house AND my finances. Very freeing! Thanks! And that’s wonderful to hear JB, well done! Your writing style “sparked joy” for me! Thanks for sharing these thoughts today! I have been on a journey to neaten up, discard unnecessary things and simplify my life as well. I want to add a suggestion for you and your readers that has set me years ahead on this journey-“the Minimalists” they have a documentary and a website and a wonderful podcast. The young men who are behind this have a really unique way of distilling down into the “ why” for our desires to gather stuff-and have helped me to have clearer thoughts and a to be able to clear out the clutter!! Hello Sydney, nice to finally hear from you! Haha I just “Marie Kondoed” my garage yesterday. It was a bit hard getting rid of some of the stuff, not physically but sentimentally since a lot of my boys old toys and sports gear reminded me of the good ole days. Thanks and yay, good for you! Yes the garage can be tough, especially going through sentimental items. I bet it looks so much better now. I smile every time I walk through our garage now because it is so much cleaner. I used to feel a weight on my shoulders before we cleaned it out. So glad it’s in better shape now and yours is too. “Sydney? Who’s Sydney?? ?” was my first thought when I saw the post author’s name. I then assumed it was some other personal finance blogger doing a quest post. Imagine my excitement when I discovered Sydney was Sam’s wife!!! Nice to read something from you Sydney! I’ve always wanted to thank you for helping motivate Sam to take that long, early morning bus ride into the city that resulted in his first Finance job. You two make a good team! :) Thanks Kathy! Appreciate your kind words and glad you enjoyed the post. Great job tidying up your home! However, I’m not a big fan of Marie Kondo. A little clutter is comfortable for me. Alas, we are moving next month so we have to clean out some stuff. I just donated 50% of my clothes and shoes. Now, I have to go through my books and CDs. Moving gives me the motivation to get rid of stuff. Thanks! No problem, to each his own. If you have a system that works for you that’s good. Yes, decluttering before moving is one of the best times to do it. That was brave sharing a picture of your counters! Wow, that is a lot of stuff! 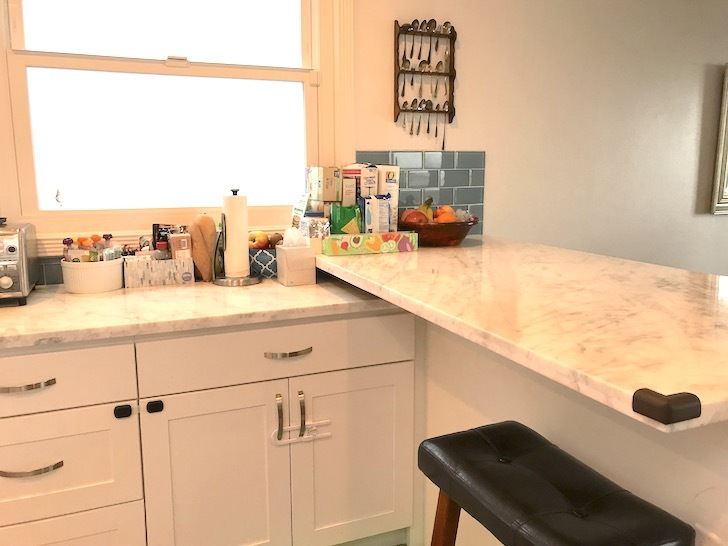 I watched a few episodes of Marie Kondo and I thought she had some good tips for organization. It is a little depressing to see how much crap some people have in their houses that is a waste of space and money. But it is also is great to see people getting more organizing and cleaning up. Haha, yeah there was a lot of stuff on the counters. 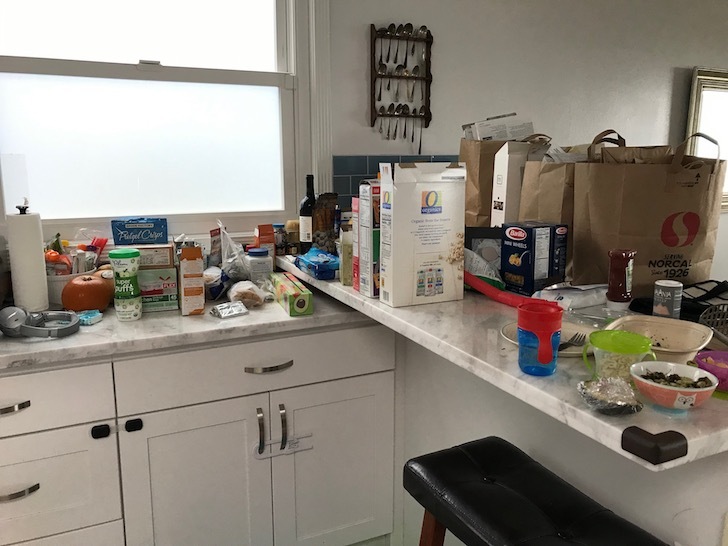 Now we’re better utilizing our cabinets and are better about not using the counters as a dumping ground for all kinds of misc things. Yeah it’s kinda nuts how much we all tend to accumulate. Being more mindful of purchases and having a designated place for everything really helps cut down on clutter. I can definitely relate to the toddler factor. A toddler makes it way more challenging to tidy up. And your comment about the rush of donations to thrift stores got me thinking… Maybe it’s time to stop by my local thrift store, browse the shelves, and see what sparks joy! Thanks! And yes thrift stores are hopping lately. I saw a video the other day about how many places have had to turn away donations lately because of an influx in supply from people giving their houses KonMari makeovers. The positive for shoppers like yourself is there’s really good inventory right now. 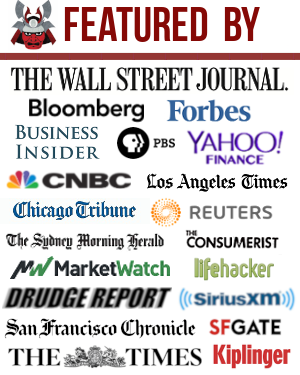 It’s nice to finally meet the muscle behind Financial Samurai! I really enjoyed this post. I go through decluttering cycles every couple of months, although I haven’t tried this specific method. I suffer from sentimental attachment (I had “one day I’ll fit into these clothes” that I can’t bear to part with but luckily I’ve lost some weight and am using them so I am down to about 3 pants left in the bag), FOMO (buying because I don’t want to run out of stuff or there’s a sale I don’t want to miss) and lastly holding on to items because someday I will need to use it. I started seriously decluttering a few years ago and am finally at a stage where I’ve got at least 2 empty cupboards and 2 half empty drawers. May not sound like much but coming from overflowing cupboards that wouldn’t close, it’s better but then there’s always room for improvement. I only recently realised I have too much accessories and makeup. :( I have a mini plastic cabinet full of unopened makeup but on the bright side I did get rid of one mini-plastic container of accessories. I’ve followed rules 1-3 and 6 for years but rule 5 is new to me. Rule 4 came to me a few months ago when I’d let the ironing pile up. After spending a good 8 hours slogging (ironing) through 3 ice cream cone baskets (technically one was a very large bin) of clothes and beddings, it was amazingly easy to let go of clothes because I just didn’t want to iron any more. I try the “dispose of 3 items when bringing in 1 item into the house” rule but am only marginally successful. When I got a smartphone in November last year, I searched and found a simple app called Expiry Sync to track what I have and when it will expire. It’s really helps when you’re a bulk buyer and you’re out shopping but can’t remember if you have items in the cupboard and the expiry dates on them. I’ve even extended it to my makeup cupboard. Several times now I’ve unexpectedly come across sales and by having my grocery and makeup cupboard contents with me, I’ve made snap decisions on whether to buy an item or not and it’s saved me money by buying or not during a sale. I hope this is the first of many blogs for you! And remember the more stuff you take with you when you move, the greater your shipping charges will be! P.S. the link under website is my universal book link to a novella I published last year and not spam. Thanks for your long and thoughtful comment! I know how hard it can be to part with some items. Miscellaneous items and papers are hard for me, clothes are easier. I held onto a lot of pre-pregnancy clothes in hopes I would fit back into them. I finally made peace with my new post-baby self and accepted that my hips just aren’t going to shrink back. ;) Saying thank you to my clothes that I loved but no longer fit and thinking about someone else enjoying them really helped me let go. And now I don’t feel frustrated when I open my drawers because I can fit into the items I have left. It is so fun to purge and organize, I agree. It is also very gratifying to clean up since you see immediate results. Is it strange I like to use Pine-Sol and clean our toilets? The Dyson vacuum is the bomb. What a joy to use! I still remember the time when you gifted me a broom for Christmas. We took the funny picture and I wondered what was wrapped inside. A small house is great for organization and cleanliness. Still not 100% sure whether we should up size. As solution is to just get out of the house more. Glad we at least have options. Hahaha your organizational lead huh? Mmm hmm. I do credit you for helping out a lot around the house because you are awesome at wiping down the countertops, vacuuming, cleaning the bathrooms and helping with the dishes – thank you! Thank you, that’s so nice of you to say. :) Glad you are a KonMari fan as well! Yeah it’s too bad there are are always bad apples out there who choose to take their own issues and unhappiness in life out on other people to try and make themselves feel better. Welcome to my regular world! Remember, you must write in a way to leave no reader behind! I think I want to experiment with publishing posts that are just 1 to 5 paragraphs long. Could be good. Will save me time. Bob – are you the star of that movie, Minions? What a great recap. I kept hearing about this but honestly never explored what it was all about. I think the big thing is having all family members on board. I don’t think it will work for me just yet as I have a teenage girl in the house and I have honestly given up trying to keep things organized the way I like it (and before I had her, I foolishly thought girls were neat and it was the boys that were messy). Love the tie in with finances as well. That part is much easier for me to do as it is more of an individual effort in my household. You and Sam make an amazing duo and hopefully you start writing more on the blog as well. Yes, having the whole family on board makes a big difference in the makeover process and especially the maintenance. Thanks for your kind words and yes I hope to write more too! Thank you for the post Mrs. Samurai! Great to see your name on a byline. You’re quite welcome Eric and thank you! Nice to see your post, Sydney! My wife and I lived in Japan, so we’ve long been familiar with Marie Kondo. But just last weekend, we were suddenly inspired to donate half our clothes and reorganize the house. 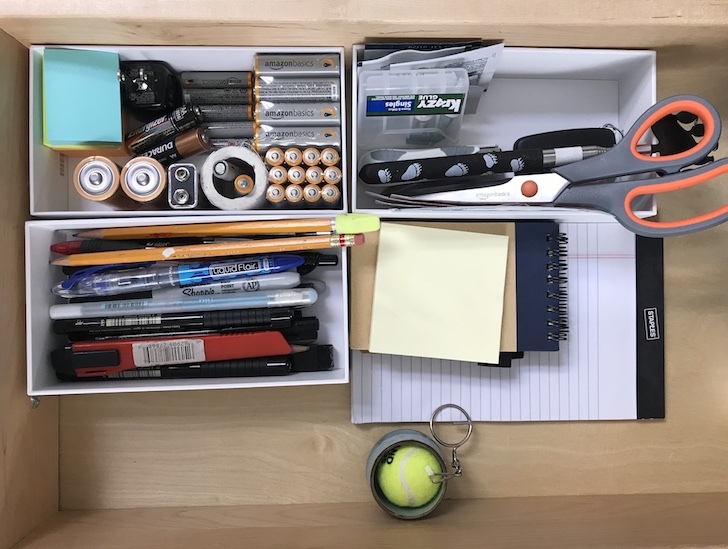 Life feels more under control when you open a drawer and everything is perfectly neat. Keeping it that way is the hard part, though! Fantastic to hear you donated half your clothes and did a bunch of reorganizing. Yes, hard to keep it all perfectly neat, but it’s worth the extra effort. Finally we meet the woman behind the man! Sydney you seem absolutely charming and adorable. This is a great article and I dare say you may be a better writer than Sam, which is a high praise. Hope we see and hear more from your perspective in FS. 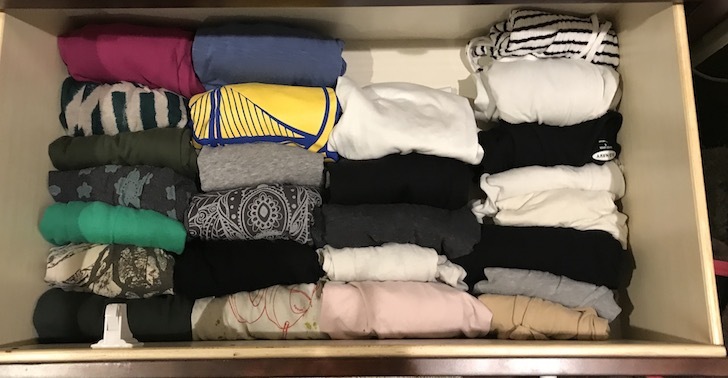 My wife has become similarly consumed by KonMari. Helpful to have it explained and illustrated so clearly. Well of course she is. She also scored higher on the verbal portion of the SAT as well and got into UVA, while I got waitlisted. Now my master plan is for her to write regularly so I can kick back and relax more as we surpass our 10 year Financial Samurai anniversary! Yes, here’s to team work and proof it is possible to work with your spouse! I hope to write more as well. I don’t have Sam’s speed but I do share his love for writing. We recently fell into the KonMari craze as well by watching 3 or 4 episodes. My wife and I might need to do something in the future when we finally buy our house. Luckily, we know that’s coming and have largely avoided buying anything not considered a necessity. That’s gone a long way in fighting the clutter. We plan to go through our clothes again soon to remove anything which doesn’t bring hs joy, like the KonMari system advocates. I’m interested to see how that process goes for us but am sure it will be impactful. We’ll be sure to share some before/after photos with you when we’re done. It really is addicting in a good way, isn’t it? :) Good call on cutting back on shopping before your move. It really helps to think, hmm do I really need this and want more stuff to pack when we move? Nah. Good luck on your clothes gathering and discarding! Can’t wait to see your before and after pics. I started rolling my underwear and it saves a lot of space and I no longer pull out and unfold (by mistake) two or three pairs. Also watch the batteries – vertical ones tend to leak. Nice!! I shrunk my underwear drawer probably by 4x by folding and discarding ones that no longer fit lol. It’s so much easier to find things now. Good to know on vertical battery leakage. I didn’t know that, thanks! Aha, so that’s what the Marie Kondo craze is all about. Thanks for the overview and love your before after pics. I heard about the Netflix show but haven’t watched it. Makes sense to fold things vertically like that so it’s easier to see stuff if you have the patience. I’m guilty of never folding my laundry. I usually end up throwing clean laundry all over the place trying to find something haha. I should go through all my clothes this weekend and find some stuff to donate. I could use some extra space. I know I at least have a bunch of tshirts that have shrunk that’d be good to give away. Finding them all will be a challenge (I’m guilty of leaving stuff in random places) but I’m a fan of moving towards “less is more.” Thanks for the motivation. Thanks Jamie. I’ve definitely had some days when I throw clean laundry everywhere to find something too, especially during the first year of being a ft mom. Laundry feels never ending with a little in the house! Good luck on your clothes clean out this weekend. I think you’ll be surprised at how much you can find when you start searching for it. I’ve had several “oh that’s where this went” and “oh wow I totally forgot I had this” moments going through our house and I’m not even done yet! Donating feels wonderful too, especially when you hand over all the bags and get a receipt. Satisfying!